Wisconsin’s new attorney general is promising a new direction for the state justice department. In his inaugural remarks, Democratic Attorney General Josh Kaul pointedly criticized Republicans in the legislature, who moved to restrict his authority during a lame duck extraordinary session last month. Kaul, who defeated Republican Brad Schimel in November, said he’ll push for universal background checks for gun sales, and a “red flag” law to “temporarily disarm” those who pose a threat to themselves other others, among other things. The tenor of Kaul’s remarks did not go unnoticed by one of the principal Republican architects of the lame duck session. 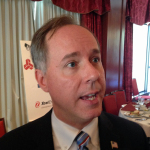 “I would say on a day where we’re trying to find consensus and work together and show that we can act bipartisan, to have a hyper-partisan speech kind of throwing down the gauntlet, probably doesn’t set the tone that I would want,” said Assembly Speaker Robin Vos.